Students gain hands-on lab experiences in Bar Ilan University - including unthinkables such as converting one cell into another. More than two dozen undergraduate science majors from prestigious American universities are participating in the sixth annual Summer Science Research Internship Program in Bar Ilan University in Ramat Gan, Israel. The students are from Yeshiva College, Cornell University, the University of Maryland, Stern College for Women, University of Pennsylvania, Illinois Institute of Technology, and Brooklyn College. 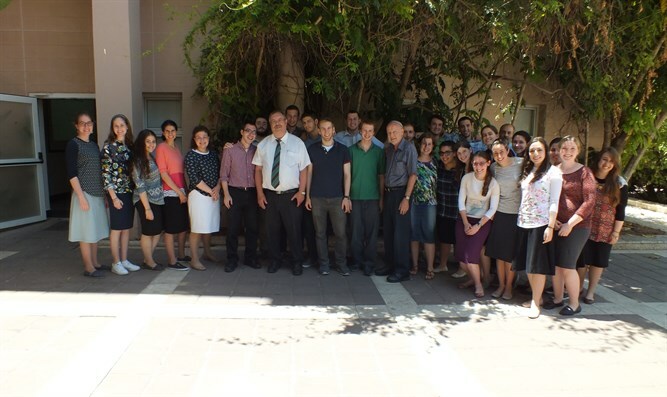 They are taking part in the joint Bar-Ilan University (BIU)/Yeshiva University (YU) initiative. The program enables students to gain hands-on experience in emerging scientific fields, while being mentored by some of Israel's finest scientists. Prof. Ron Goldstein, of Bar Ilan's Mina and Everard Goodman Faculty of Life Sciences, is mentoring a student working on a project that once would have been considered science fiction: converting one kind of a cell into another. "When I went to college/graduate school" Goldstein said, "we learned that once cells differentiate, or take on a specific identity/functional role in the body, this is a permanent choice. But over the past 5-10 years, it has been shown that manipulating the expression of specific genes can actually change their identity. "My student's project," Goldstein explained, "is to recapitulate and advance this technique, to make human neurons of the peripheral nervous system (those not located in the brain) for our studies of the chicken pox/shingles virus. She is doing the molecular biology work necessary to make special viruses that are used to introduce foreign genes into cells." The purpose? "In our current technology, we use a mishmash of brain and peripheral neurons, while ideally, we would use only those really infected in the disease." Program director Prof. Ari Zivotofsky, of Bar-Ilan's Interdisciplinary Brain Sciences Program, matched students with mentors and research assignments that would both enhance their summer experience and promote individual growth and career development. "Our unique program gives talented U.S. university science students the opportunity to become embedded in a high caliber Israeli university lab, thereby experiencing – rather than just hearing about – what it is like to live, learn, and research in Israel," said Prof. Zivotofsky. "In the labs, they become part of a team and contribute to the ongoing projects. Spending their summer with a like-minded group of peers fosters an unparalleled commitment to research, Israeli science, and religious Zionism." While the focus is primarily on lab work, the program also includes trips to scientific and industrial sites around the country, including IAI (Israel Aerospace Industries), Teva Pharmaceuticals, and the laboratories of the Agriculture Research Organization (Volcani Center), as well as a series of lunch meetings with BIU faculty. To strike the proper "Torah and Science" balance, students supplement their daily lab work with nightly chavruta (joint) study and Torah classes at the Caroline and Joseph S. Gruss Institute in Jerusalem. During the seven-week research experience, which ends Aug. 8, students are conducting intensive internships in Bar Ilan's research laboratories with faculty members from various Bar-Ilan departments: The Institute for Nanotechnology and Advanced Materials, Gonda (Goldschmied) Multidisciplinary Brain Research Center, Faculty of Engineering, Mina and Everard Goodman Faculty of Life Sciences, and the Departments of Mathematics, Chemistry, and Psychology. Since its inception six years ago, the program has benefited from the generosity of Dr. Mordecai D. Katz, Honorary Chairman of the Bar-Ilan Board of Trustees, who has supported the YU student participants, and from the J. Samuel Harwit and Manya Harwit-Aviv Charitable Trust.